You can use data export to move your QuickBooks Online (QBO) information to another version of QuickBooks. Important: Exporting your data does not cancel your QuickBooks Online paid subscription. If you would like to cancel your account, please see How to Cancel your QuickBooks Online Company. Moving your file within QuickBooks Online? Currently, there's no way to directly move your data from one QuickBooks Online company file to another. You need to export the file to Desktop (Windows or Mac) and then convert the Desktop file to QuickBooks Online (Windows or Mac). REMINDER! The steps provided within this section are intended to ensure that both Internet Explorer and QuickBooks are properly set up to allow a successful import. Do NOT skip any of these steps to ensure successful conversion. Currently, exporting into QuickBooks Desktop is only available in the US version of QuickBooks Online. For non-US versions, you can export list items such as customers, vendors, products and services, chart of accounts into Excel then import them into Desktop. You must be a Master Administrator, Company Administrator, or invited accountant in order to use the export feature. You need to use a PC with Internet Explorer 10 or higher. You must have a supported version of QuickBooks Desktop for Windows installed on the PC in which you are performing the export. For access to trial versions of the desktop program, for the purposes of export, see QuickBooks Desktop trial links. We do not support the 64-bit version of IE. If you attempt to export using this browser, you'll receive a communication error and won't be able to continue. ActiveX is required to export from QBO. Our content addresses customers who have not yet installed ActiveX and would like to export. For important information on the limitations of export, please see Export limitations - QuickBooks Online to QuickBooks Desktop. From the Menu Bar, select Tools, then choose Internet Options. From Internet Options, select Security. Add *.intuit.com to trusted sites. From the Trusted sites window, uncheck Require server verification (https for all sites in this zone. Note: It is recommended that you remove all other websites in reference to intuit.com from the list of websites, as *.intuit.com will cover all Intuit sites. Close the Trusted sites window. Select Apply, then choose Okay. Close Internet Explorer. Note: After closing Internet Explorer, proceed to Step 2: Run QuickBooks Desktop and Internet Explorer in Administrator Mode. Locate the program from a desktop shortcut, or through the programs in the Start menu. Right-click on the program, then select Run as administrator. Note: For visual references of the steps contained in this article, you can view the Visual Guide to Export. Open your QuickBooks Online company. Select the Gear icon at the top. Under Tools, choose Export Data. Note: A pop-up window appears with a quick question about your reason for exporting. Choose your reason, then select Continue. Select Install ActiveX Control Now. Note: There will be another window that will prompt for the next steps to install ActiveX. Choose the date you want to export. At the bottom right, select Continue. Note: You will receive an email with steps to complete the export conversion within a few minutes to 2hrs, depending on the amount of data that is being prepared. Receipt of this email means the data has been compiled and you are ready to move on to the next steps. In order to get to the Continue to Download option within the export process, you will need to repeat a series of steps. Under “Moving to QuickBooks Desktop?”, select Learn more. 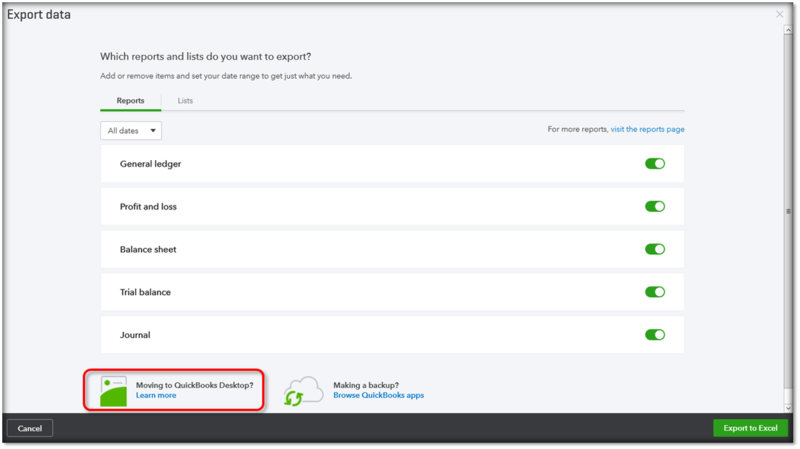 In the Exporting from QuickBooks Online page, select Continue to Download. Verify that the version of QuickBooks Desktop, to which you are exporting, is open and sitting at the No Company Open screen. Important: If a company file is currently open, you need to close that file before proceeding. How do I close QuickBooks company? From the File menu, choose Close Company. Note: This will place you at the No Company Open screen. In the Save your company file pop-up window, select a location to save the export company file. Note: It is not recommended to change the file name and to save the file to your Windows Desktop. After the file has finishes downloading, select Convert Now. In the Create new QuickBooks file pop-up window, give the file a name and save the file to a local directory. Important: We strongly recommend saving to your local directory. Attempting to save the file to a network directory or external media may result to conversion failure. This will display a pop- up dialogue window containing a status bar. If the status bar does not appear to be processing, check QuickBooks Desktop for an Application Certificate. How do I check QuickBooks for an Application Certificate and allow the conversion? In your Windows Task bar, choose the active QuickBooks desktop session, to bring it to the foreground. Note: This should also display the Application Certificate. Within the Application Certificate, choose Yes, prompt each time. Select Continue. In the confirmation window that follows, select Done. From this point, a new company file will build itself within QuickBooks desktop with QuickBooks Online data. When it’s done, QuickBooks will open within the new file. After the export completes, select Finished. After you've exported your data, run a Balance Sheet and a Profit and Loss report to ensure that the numbers match. The reports must be run on an Accrual basis and for All Dates in both programs. Important: If the report totals don't match, check to be sure you ran both reports on Accrual basis and for All Dates in the date range. Then make sure no data was entered into either application after the export. If the data still doesn't match, please contact a Customer Care consultant for assistance.